A small group of houses built on the site of Oak Bank House. The Coach House is the original building for that purpose dating from the 1850s and restored to domestic use in 1984. Four detached houses were built in 1983-5 on the site of the original house. A further property was built a few years later and another has been built since 2010. The original Oak Bank House was built in a redundant quarry by John Briar in 1854, a very large and imposing house. He established a delightful landscape of fine trees around the house which is his legacy to us today. The house was damaged by fire in 1905 and never fully repaired. It ceased to be occupied by 1935 and it was demolished around the end of WWII. The Oak Bank site was then used for some years to store thousands of tons of Bollington’s coal supplies. After that ceased the site was locked up and forgotten until 1983 by which time it had gone completely wild. 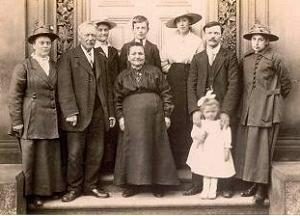 Charles Frederick Price and his family at the front door of the house (left) probably c.1918. Charles Price was the gardener. One would expect that his wife was the housekeeper. They lived in the Lodge Cottage at the bottom of the drive. Notice the fine carved stonework in the door frame – there is a suggestion in one paper I have seen that this was the work of Alfred Gatley, the famous Kerridge sculptor, in which case its loss when the house was demolished was indeed a great loss. 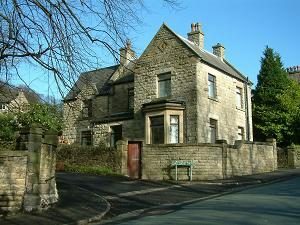 20A Shrigley Road is the original Lodge Cottage (left) at the end of what was then a private drive to Oak Bank House. John Briar’s JB monogram can be seen on the gable end. The leftmost section of the cottage was added in the late 1980s very much in keeping with the original structure. 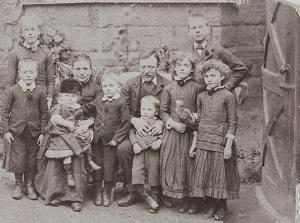 The Price family living at Oak Bank Lodge cottage (left), in the 19thC, perhaps about 1870, when the children, some of whom appear in the top picture, were young children. Ten of them lived in this three bedroom cottage! Notice the curved door to the right – it is still there today visible in the picture above left, albeit rebuilt in modern times. Your writer (Tim Boddington) has lived at Oak Bank since 1984. 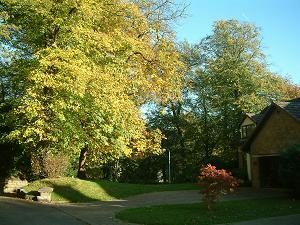 I had recognised it as an interesting location for a house but had never ventured into the site until one day in 1983 when, for the first time since I had known the site, the gates were open and there were signs of activity. I went up and almost all of the site was overgrown to such an extent that it was impossible to see out over the village! However, I knew where White Nancy should be. I was sufficiently impressed to buy the house the construction of which was shortly to begin. If you want to see how good the view is look at the pictures in Wallpaper – all those showing Kerridge Hill were taken from my garden. When we cleared the site to create the garden we discovered just how much coal was left! There were heaps of nutty slack all over the garden. Some I removed but many are buried beneath the modern planting. No excavation is completed without a few shovels of coal. This street is in the Bollington Conservation Area. A Tree Protection Order (TPO) is applied to the original trees.